Last April, according to Universe Today, the Congressional Appropriations Bill directed NASA to “to begin supporting the scientific search for technosignatures as part of their larger search for extra-terrestrial life” (emphasis added). In late September 2018, NASA hosted the NASA Technosignatures Workshop at the Lunar and Planetary Institute in Houston, Texas. The report from this workshop was released on November 28. Government funding for SETI has been low to nonexistent ever since Senator William Proxmire gave it his notorious “Golden Fleece Award” in 1982 as an example of government waste (Wired Magazine). Afterwards, NASA scaled down its expensive “Project Cyclops,” a Sagan-era dream to link a vast array of large radio dishes in the search for alien signals. Proxmire agreed to a compromise that would allow NASA centers, including JPL, to work on sky-scanning technologies. SETI enthusiasts have had to continue with private funding, but have made steady progress in detection technology. The elusive aliens, however, remain undetected. The S-word SETI has remained a golden albatross on NASA’s neck, making administrators skittish to bring it up again. “Technosignatures” is just abstruse enough to evade most Congressional waste hunters. A related jargon word, “astrobiology” has succeeded well at NASA. In fact, the search for generic “life” in space has become a principal goal throughout the agency. Hardly a planet or body gets reported without highly imaginative speculations about life there. Investigating whether other such bodies are habitable is legitimate science, and is not controversial to members of the intelligent design community. Habitability does not mean a planet is inhabited. Guillermo Gonzalez, for instance, wrote about the “galactic habitable zone” before his book with Jay Richards, The Privileged Planet. It’s good to be able to characterize the requirements for a life-enabling habitat with real data, even if no organisms are ever found. If nothing else, such knowledge can help us appreciate what an improbable world we live on. As exciting as it might be to find microbes or plants on another world, though, the real tingly feeling among SETI enthusiasts comes from the dream of communicating with other minds — or even just knowing they exist. That’s where the word “technosignatures” goes beyond “biosignatures.” Biology uses a plethora of signals, from the single cell to the singing humpback whale. While secularists may debate about the similarity of whale or parrot intelligence to human intelligence, no creature besides the human being uses tools to make tools. No other mammal builds radio telescopes to beam messages into the lonely void, seeking answers to philosophical questions that have nothing to do with reproduction, fitness, or survival. The I in SETI specifies a targeted search for this kind of intelligence: minds who build things for a purpose. This latest SETI movement is more like eavesdropping than listening. The techno in technosignatures specifies targeted searches for complex specified information. Even if extraterrestrials are not communicating with us, we should be able to detect their technology. We should be able to distinguish between natural signatures and technosignatures. Why? Because technological artifacts will display intentionality, provided they exhibit irreducibly complexity and a sufficient level of improbability. The commonality of SETI with ID is inescapable. By funding the search for technosignatures, no matter how modest the funding level at this time, NASA is essentially funding ID research. Technosignature hunters may argue that ID is not applicable, because, in their view, the alien beings evolved by Darwinian evolution. The actual methods of search, however, as well as the search targets, involve design by intelligent beings. Both parts of the word “techno-signature,” in fact, imply ID. It must be technology (goal-directed behavior beyond natural causes or instinct), and it must be interpreted as a signature, a sign pointing to something beyond itself. As with old SETI, the whole premise is that intelligent causes can be distinguished from natural causes. Information: “What features of a civilization as a physical phenomenon can’t be avoided? This question can take on a thermodynamic or information-theoretic character: what tracers can and cannot be avoided in the process of civilization building? In his talk, Charles Beichman from JPL gave several historical examples of false positives, where natural phenomena were at first mistaken for alien signals. The discovery of pulsars is one famous incident. His point was that the hunt for technosignatures is like looking for a needle in the Cosmic Haystack, and searchers need to be careful not to be misled by unknown phenomena that have a natural cause. This sounds very much like Dembski’s design filter. One must rule out chance or natural causes to a sufficient degree of specified complexity before concluding intelligent design. What sorts of technosignatures would an extraterrestrial technological species generate? Which of those are detectable? How will we know if we have found one? If we find it, how can we be sure it’s a sign of technology and not something unexpected but natural? In much the same way, the hunt for technosignatures is limited to technologies that we know are feasible. However, there are also some key differences between technosignatures and biosignatures. As they explain, many proposed advanced technologies are either “self-luminous” (i.e. lasers or radiowaves) or involve the manipulation of energy from bright natural sources (i.e. Dyson Spheres and other megastructures around stars). There is also the possibility that technosignatures will be widely distributed because the species in question may have spread their civilization to neighboring star systems and even galaxies. Notice that technosignatures may consist of “natural sources” that have been “manipulated” out of their natural state. Unaided stars will never make Dyson Spheres, wherein structures have been positioned around a dying star to conserve all its energy. That would take alien engineering. Human engineering manipulates natural materials to form pyramids, skywriting, and books. It’s not the material, but the way it has been arranged, that qualifies an artifact as a technosignature. Incidentally, nobody seems to be complaining about “methodological naturalism” (MN) in this new SETI program. Suppose they find a technosignature. They will have found evidence of a mind at work — the mind of a being they know nothing about. It might not even be physical, for all they know. Would the metaphysical naturalists call such a discovery outside the bounds of science? We all know what minds can do, such as creating Mount Rushmores and Eiffel Towers. If it would be senseless to limit the explanation for our monuments to natural causes, it is just as senseless to require MN for explaining alien technosignatures. 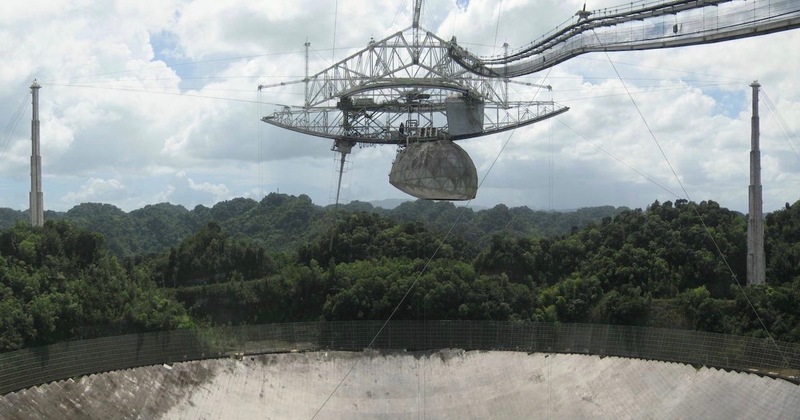 Photo: Arecibo Observatory, Puerto Rico, via Wikimedia Commons.